Earlier this week, I stepped down from the board at Grubhub, after nearly 6 years with the company. Spectrum Equity’s involvement began when we spun the Seamless business out of Aramark, a multinational business services company with over 300,000 employees. The transition into becoming a stand-alone entity was challenging and took six months to negotiate, but it was critical to position Seamless for future growth in this dynamic market. Our experience with online marketplace businesses gave us conviction in the uniqueness of the Seamless business. We believed that the business could grow even faster with disciplined, data-driven marketing as well as increased investment in the product. All of this required building out a world-class management team around Jonathan Zabusky, Seamless’ CEO. The merger between Seamless and Grubhub in 2013 was a major milestone on this journey. It was a complicated transaction with a disparate group of shareholder and management interests to navigate, but the end result has been well worth the effort. The company completed a successful IPO in April 2014 under the leadership of CEO Matt Maloney. Like many public companies, the market’s enthusiasm for the company has ebbed and flowed, but the underlying performance of the business has been extraordinary throughout. In 2016, the company generated $493 million in revenue and $145 million in EBITDA, more than 3x its revenues from 2013, the year prior to the IPO, and over 10x the revenue from 2010 when we originally invested in Seamless. On an average day, there are now over 290,000 orders made on the company’s websites and mobile applications. Despite competition from a broad range of startups and larger companies, Grubhub continues to thrive as the leader in a huge market. Stepping away from the board is bittersweet, but I leave knowing that the company is led by an incredible group of executives and board members. All of us at Spectrum, especially Pete Jensen and John Connolly who worked on the investment with me, are proud that we played a role in helping the company get this far. Grubhub Inc. (NYSE: GRUB), the nation's leading takeout marketplace, today announced the resignation of Benjamin Spero from its Board of Directors and Compensation Committee. Spero is departing in order to increase his focus on other business interests. "We would like to thank Ben for his invaluable leadership during our last five years of rapid growth and transformation," said Matt Maloney, Grubhub CEO. "He was instrumental in guiding Seamless through its spinoff from Aramark, merging Seamless with Grubhub, and completing the initial public offering of the combined company. His entrepreneurial knowledge and operational expertise have helped Grubhub become the clear market leader in online takeout ordering in the United States, and we wish him well in his future endeavors." "I am incredibly proud of the progress Grubhub has made in the past five years and excited to watch its future success," said Spero. "I am leaving the Board to focus on earlier stage companies, but continue to believe that Grubhub is the best positioned company to capitalize on the massive opportunity in online takeout ordering." Spero first joined the Board as a Seamless director in June 2011, and served more than three years as a Grubhub director following the merger in August 2013. After his departure, Grubhub will have nine directors, including eight independent members with significant public and private company leadership and operating experience in a broad set of industries. Grubhub (NYSE: GRUB) is the nation's leading online and mobile takeout food-ordering marketplace with the most comprehensive network of restaurant partners and largest active diner base. Dedicated to moving eating forward and connecting diners with the food they love from their favorite local restaurants, the Company's platforms and services strive to elevate food ordering through innovative restaurant technology, easy-to-use platforms and an improved delivery experience. Grubhub is proud to work with more than 50,000 restaurant partners in over 1,100 U.S. cities and London. 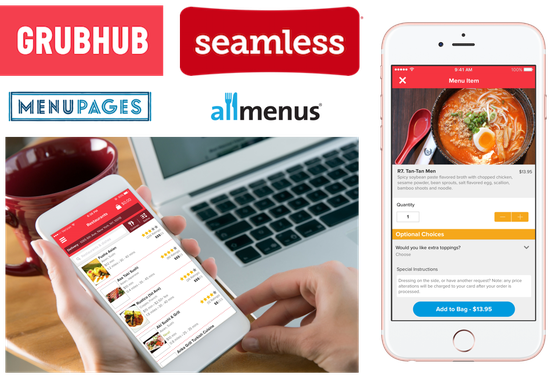 The Grubhub portfolio of brands includes Grubhub, Seamless, AllMenus, MenuPages, LAbite, Restaurants on the Run, DiningIn and Delivered Dish.